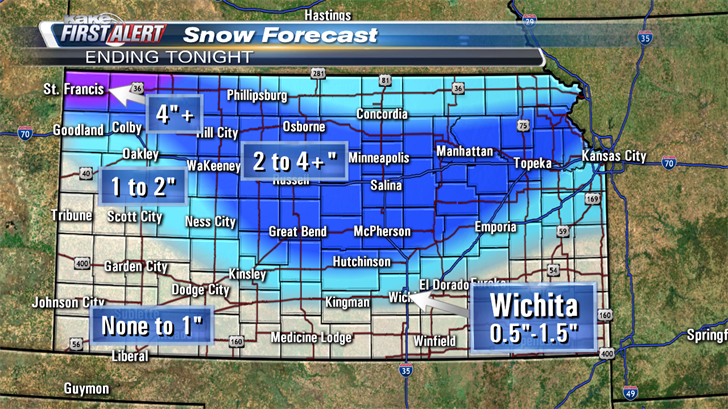 A quick moving system brings snow, rain and plenty of cold to KAKEland Thursday. While snow totals won't be extremely high, travel could be impacted especially across Central Kansas on roads that remain un-treated. With temperatures near or below freezing, snow will be most likely for Western Kansas Thursday morning with a few sprinkles mixing in along the Kansas-Oklahoma State Line. The snow and rain will gradually fill in and slide east through the day on Thursday. High temperatures on Thursday are expected to only climb into the mid to upper 30s and some locations may hit their day time high during the morning hours.. With temperatures forecast in the mid to upper 30s, rain and snow will be possible, especially across Southern Kansas. Snow accumulation will be very light across Southern Kansas, including Wichita, with less than 1.5 inches of accumulation and much of that accumulation will be on soft surfaces like grass and cars. North and West of Wichita snow totals will be higher with the heaviest snow falling in Central Kansas with some communities picking up 2-4 inches through evening. 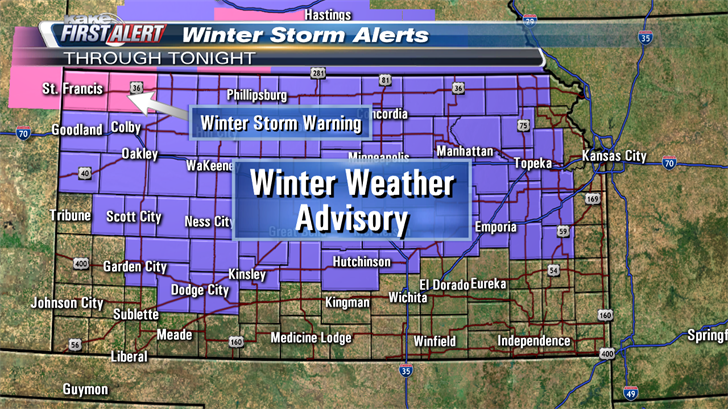 Snow could create some localized travel concerns across Central Kansas where the heaviest snow is expected. High snowfall rates could reduce visibility and create slick spots on untreated roadways. Ground temperatures should help melt much of the falling snow across Southern KAKEland. Overall, travel conditions should improve late Thursday into Friday Morning. During winter weather, you can check Wichita road conditions here and conditions across the state here. We’ll keep you up to date with our Interactive Radar and LIVE weather coverage. Get those features and more on the free First Alert Weather App. With the app you can also track weather in your area, stream the latest forecasts, upload photos and video, and set customized alerts to keep you and your family informed and safe. You can also post pictures to the KAKE Weather App Facebook page.